Do you remember the days where blasting out the same marketing communications to your entire database worked? Neither do we. 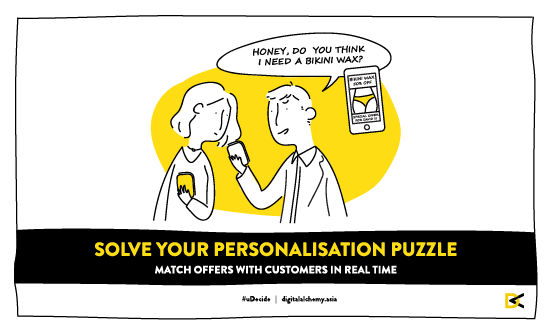 Personalised marketing is nothing new and with more data becoming available every single day, personalisation is no longer a nice-to-have but a must. Consumers know their behaviour is tracked and expect nothing less than this information being used to personalise their customer experience. Yet, they still often receive irrelevant offers and content from the organisations they’re engaging with. Delivering effective personalisation isn’t easy, if it was, everyone would already be doing it – and doing it well. In today’s world of real time, always on marketing, the ability to constantly learn what content, campaigns, offers, channels, you name it, a customer is engaging with, and conversely not engaging with is too much to take on for us humans. We make decisions based on what we know and what we’ve experienced and can’t comprehend data in as broad a context as a machine. uDecide® helps organisations that find themselves overwhelmed with data and aren’t sure how to leverage it successfully to serve customers better. At the heart of uDecide® is a machine learning engine that looks at each customer’s dataset (behaviours, transaction history, preferences, and more), scores offers, and determines the most relevant communication for each individual. For organisations, this means more relevant conversations, happier customers, and increased incremental revenue. The stakes for winning long-term customer loyalty are more important than ever – act now and learn how you can make that difference with uDecide®.